Treat your two wheels with care and enjoy riding safely. Once you’ve ridden with two wheels, there’s no going back. A motorcycle offers a new sense of freedom, more control, as well as giving you a daily dose of thrill. While driving a motorcycle takes different skills than driving a car, the rules of the road are still applicable and more safety is required. As you are more exposed on a motorbike, you should take steps to ensure that you have the correct education, knowledge of traffic laws, and sensible driving to protect yourself on the open roads. Always wear a helmet with a face shield or protective eyewear – Wearing a helmet is the best way to protect against severe head injuries! A motorcycle rider not wearing a helmet is five times more likely to sustain a critical head injury. Get the right gear – Make sure to wear protective gear and clothing to minimize the amount of injuries in the case of an accident or skid! Wear protective clothing, boots with nonskid soles, and gloves to protect your body. Always follow traffic rules – Obey the speed limit, stop signs, and traffic lights, and rules of the road. Ride defensively – Never assume that a driver can see you! Always ride with your headlights on and stay out of drivers’ blind spots. Take a motorcycle safety course – Complete a formal riding education program, get licensed, and take riding courses from time to time to develop riding techniques to sharpen your street-riding strategies! Watch the weather – Bikes aren’t as stable as cars. Riding a bike in the rain is much riskier than driving a car. Take the car if the forecast predicts heavy rain and winds. If you must drive your bike, do so extra cautiously. Before you hit the road, check that your ride has good, working tires, working lights, and all fluids and oils are topped up and correct! While you cruise the road looking cool, you want to make sure that you don’t end up looking like a fool by getting into (or causing) an accident. 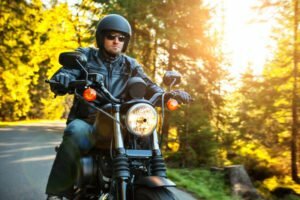 For a personalized motorcycle insurance policy that suits to you bike and budget, contact McCarty Insurance Agency, serving Fresno and neighboring cities in California.